1969 yılında Komünist Parti tarafından başkan adayı gösterilen Neruda, Salvador Allende'nin ulusal cephesine katılmak üzere 1970'te adaylığını geri aldı. Arkasından Allende tarafından Fransa'ya büyükelçi olarak atandı. Bir yıl sonra Neruda, Nobel Edebiyat Ödülü'ne layık görüldü. "Incitation al nbconcidio y alabanda de la revolution chilena" (Nixon'u Devirmeye Çağrı ve Şili Devrimine Övgü, 1973) adlı şiir kitabında ABD'nin solcu hükümetin dengesini bozmaya yönelik çalışmalarını eleştirdi. 1973'te kansere yakalanan Neruda, Allende'ye karşı düzenlenen askerî darbeden birkaç gün sonra, 23 Eylül 1973'de, 69 yaşında Santiago'da hayata gözlerini kapadı. "Anıları Confieso que ho Livido" (Yaşadığımı İtiraf Ediyorum) adı altında ölümünden sonra yayınlandı. The absurdly exciting life of Pablo Neruda, whose centenary is celebrated this month, makes Byron's look boring by comparison. With so much passionate intensity to attend to from tempestuous love affairs to hairraising chases through the Chilean mountains; from the dangerous rescue of refugees in France following the Spanish Civil War to the composition of some of the most heartbreaking poetry of the 20th century any Neruda biographer risks being overwhelmed by his largerthanlife subject. But Adam Feinstein proves perfectly suited to the task. Neither condescending nor sycophantic, his painstaking investigation, which constitutes the first authoritative biography of the poet, sheds muchneeded light on one of the most complicated of modern cultural figures. Neruda's was a life of ceaseless selfinvention. Born Ricardo Eliecer Neftalí Reyes Basoalto, he changed his name in 1920 (at the age of 16), in defiance of his father's disdain for his precocious devotion to writing poetry. The exact inspiration behind the adopted name 'Pablo Neruda' has vexed biographers, and Feinstein earns the reader's interest and trust early by producing without prejudice the full range of possible contenders. What drives the book forward, from Neruda's prodigious if penurious success as a published lovepoet at the age of 19, to the series of lonely, consular postings in the Far East in his early twenties, is an indomitable confidence in his potential significance. And it isn't long before such certainty collides with unexpected political events to propel Neruda on to an international stage. In 1933, Neruda's consular assignment was transferred to Argentina, where he became friends with Federico García Lorca. Lorca's brutal execution by fascists in 1936, when the two men lived in Spain, was as emotionally excruciating for Neruda as it was instrumental to his gradual political migration to the left. Back in Chile in 1937, Neruda was horrified by reports from Europe that thousands of Spanish Republicans fleeing Franco had been crammed into makeshift concentration camps in France. He returned to France, where he coordinated the rescue of 2,000 refugees back to Chile in an old fishing boat. By the late 1930s, the legend of the poetsaviour Neruda was in full flower and he was persuaded to stand for senator to represent some of the poorest Chileans from the the northern desert provinces. As if in quiet defiance of the WH Auden's famous assertion that 'poetry makes nothing happen', Neruda's successful campaign was carried out almost entirely through appearances at which he read his verse rather than speeches. But Neruda's robust defence of workers' rights against the repressive measures of President Videla's regime quickly placed him both in physical as well as political danger. By 1948, a price had been placed on his head and he found himself living underground, plotting a perilous journey across the Andes to escape Videla. He remained in exile in Europe until 1952. 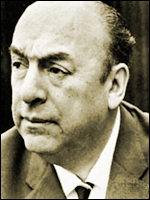 Whether finally by cancer or heartache, Neruda died on 22 September 1973, a fortnight after Allende was deposed in a bloody coup applauded by Nixon. Just as Neruda sought constantly to recreate himself, so his homeland now hopes that the centenary of one of its most cherished statesmen and authors will help it to shape a new national identity. This brilliant biography will make certain that the Englishspeaking world is not left out of the celebration. birden geliverdi. Bilmiyorum, nerden geldi. kıştan mı, bir nehirden mi bilmiyorum. Kim bilir nasıl ve ne zaman.